Allegra Muzzillo is the owner and proprietress of the Brooklyn-based boutique, You & Yours Fine Vintage. This design maven has been a writer for Real Simple and editor at Cottages & Gardens publications. Tour the 2,800-square-foot Westwood, California home of interior designer Leslie Hunt. The open-concept living space is filled with family mementos. “My home is collected—not decorated,” Hunt reflects. Soft neutrals, bright pops of color and original moldings - this vintage-filled dining room is the heart of the home. 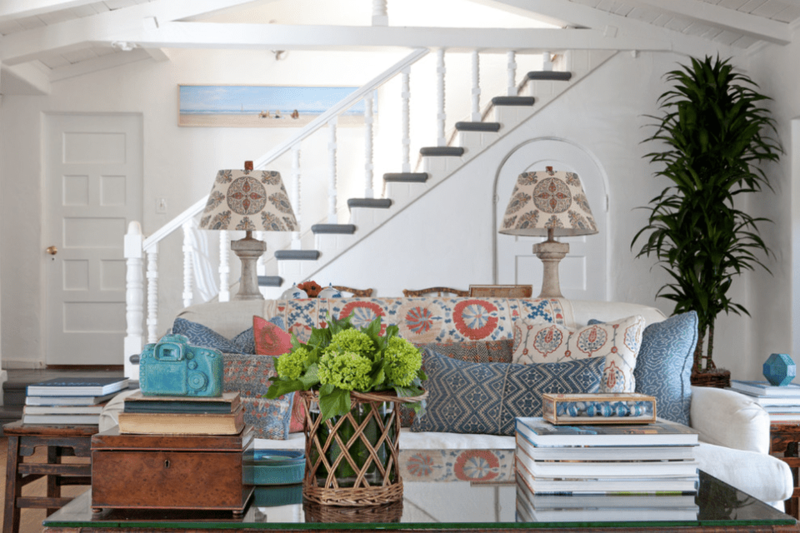 A beach-inspired oil painting by Barbara Frets leads the ascent up the front stairs, while lacquered Chapman Radcliff chairs stand guard at the base. An eclectic masterpiece, this bedroom derives color, texture and character from the reclaimed wood shutters that dominate. Hunt creates cohesiveness among disparate items by identifying common threads, such as color, style, or texture, and displaying those items together. Filled with color, whimsy and fun, this room for the designer's daughter is the perfect space to spark imagination. Above her daughter’s bookcase: a reproduction-vintage clock from Juvenile, letters and a numbers collage offers fun ways to learn. A hand-tooled leather elephant figure from India, tasseled in mismatched vintage textiles adds a global touch. In this room, a repurposed antique Irish-pine farmhouse-style dining table acts as a desk. The lamps were crafted by the designer herself from English seltzer bottles and paired with Hillary Thomas finials. The homemade lamps that flank either end of her workspace. A rattan day bed from Ballard Designs offers respite in Hunt’s office space - topped with a custom coverlet in Cowtan & Tout fabric and backed with a comfy Pat McGann flannel blanket. An ideal setting for cozy, Mediterranean-style dining, Westwood's temperate climate aids in the fantasy - allowing for outdoor dining all year round. A few of Hunt's vintage finds: birdcages decorate her outdoor space, housing a pretty assortment of ivies and succulents. Meanwhile, vintage gray stoneware pots from the local flea market round out the scene.